Having studied Contemporary Art Theory with Lily Cohen, of Danspace Projects, I could not deny that I was honored that she asked me to do an install of the artworks to be auction off for the 2011 Danspace gala. Having handled various artworks, from Nigerian mud cloths to taxidermy horse heels, I was about to feel a new kind of pressure. I have heard several handlers exclaim how they would rather not have emotional attachment to the works that they are moving, I on the other hand seem to feel some mystical bond with certain objects. Having studied and seen the art of Danspace honoree’s, Marina Abramovic’s The Artist is Present, I was honored to install one of her works in St. Marks Church. After a month of advisement from some invaluable friends we successfully installed the works of Abramovic, Pat Steir, Elizabeth Streb, Will Ryman and Holton Rower; and their presence powerfully held their own, out side of the white box and into the church! 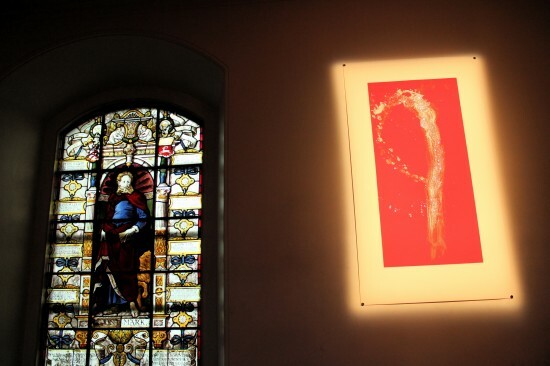 Install photo of "Spanish Brushstroke" by Pat Steir in St. Mark's Church. 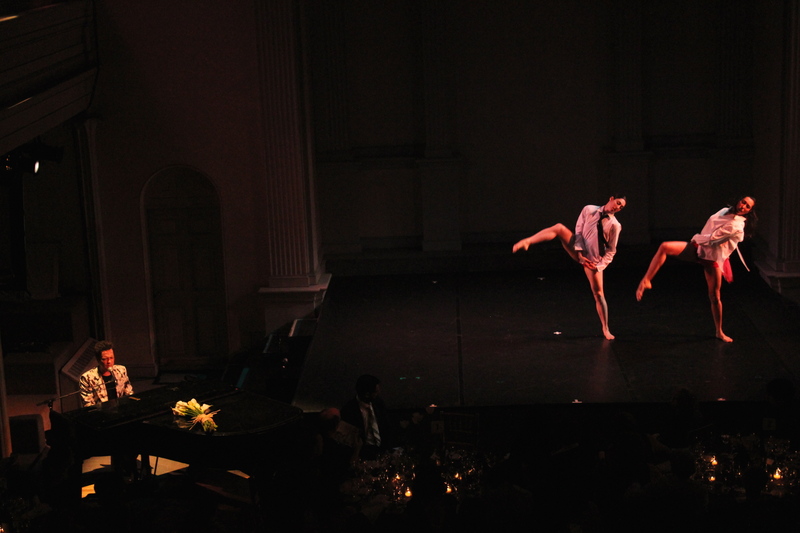 The gala was finely choreographed event that lead to an evening full of moving performances from Laurie Anderson, Trisha Brown Dance Co. and Rufus Wainwright, along with a list of some of the most promising in the creative dance world. 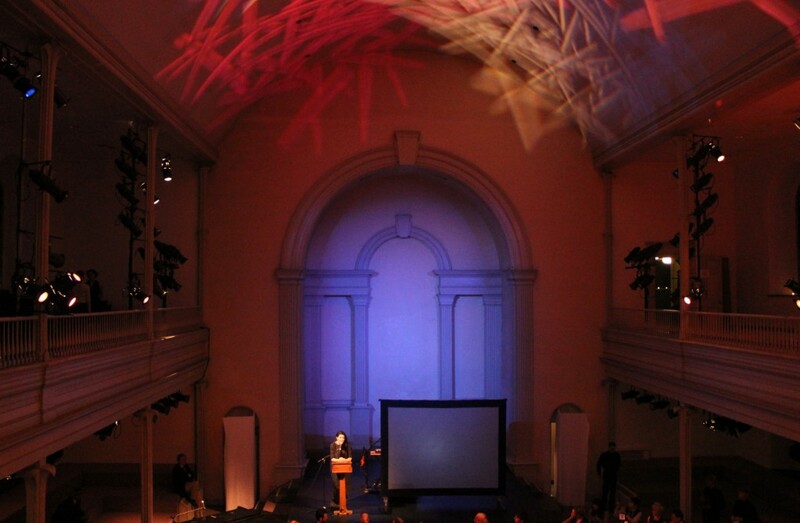 Marina Abramovic speaking at the Danspace Gala. The words from both Pat Steir and Elizabeth Strebb were encouraging and sentimental. For me the evening’s most inspiring occurrence was when Abramovic, spontaneously came on to the stage taking the mike from the MC George Emilio Sanchez unexpectedly, as he was in the midst of trying to encourage the bidding of the works. Abramovic began to tell a short story on how Italian artist Gino De Dominicis created an “invisible work” and how amazingly he sold this “invisible work” to collectors. How art handlers delivered the work to the collector’s house where it was installed and later was barrowed by a museum. Abramovic explained that if collectors can invest in works that are of this nature then they could surely invest in the works that were not so invisible. Needless to say, I was at my feet and applauding heavily. If you love performance art and dance, then I would highly consider becoming a member, volunteering, or getting involved neither of which takes a lot of money, but every bit counts. Danspace’s new initiative the “Choreographic Center Without Walls” is moving their platform into other boroughs and communities of New York City to further enrich our culture of dance.